Effervescent products, particularly in the pharmaceutical industry, have a faster reaction time that is often critical in treating symptoms of acute pain. In other functional foods, effervescent products are easier to swallow as they are in liquid form, further boosting their appeal to people suffering from either Dysphasia or Phagophobia. Persistence Market Research analyzes the effervescent products market in an upcoming report titled ‘Effervescent Products Market: Global Industry Analysis and Forecast 2017–2025’. The effervescent products market has been prepared taking into account all the important metrics such as CAGR, Y-o-Y growth rate, absolute dollar opportunity and is for a period of eight years starting in 2017. In the effervescent products market, you can expect nothing less than the most cutthroat competition. It is thus highly recommended to understand what you will face as both a new player as well as an incumbent trying to change track in the effervescent products market. We have profiled the most prominent companies active in the effervescent products market. We have given the company details and brief description, highlighted key financials, and focused on the strategies adopted. A competition SWOT analysis can be immensely beneficial as you can attack your immediate rivals in areas where they are comparatively weaker, giving you a competitive edge in the effervescent products market. The market overview section of the effervescent products market report can be considered a bird’s eye view of the effervescent products market. The introduction is the perfect first-glance at the effervescent products market and is followed by recent industry developments that impact the effervescent products market. The market opportunity map helps you assess the potential opportunities that exist in different sections of the effervescent products market on the basis of the taxonomy. A critical component of the effervescent products market report is the market dynamics section wherein we have mentioned the drivers, restraints, opportunities, and threats that pertain to the effervescent products market. A key framework for analyzing competition that exists within an industry is the Porter’s Five Forces Analysis and we have included this in our informative report on the effervescent products market. This is followed by the supply chain analysis that adequately explains the relationship between all nodes within the supply chain such as the suppliers, manufacturers, distributors, and end users. The effervescent products market report begins with the preface that includes the definition and the scope of the effervescent products market. We have specified the research objectives and answered some of the frequently raised queries key stakeholders in the effervescent products market may have. We have made certain assumptions and used acronyms while preparing the effervescent products market report. These have been clearly laid out so that our readers can dispel any confusion at the outset itself. The research methodology used by Persistence Market Research is the perfect concoction of primary and secondary research and is backed by the extensive knowledge of our team of dedicated, experienced analysts. Our report on the effervescent products market delivers all the necessary insights in a simple, easy-to-understand format. Our analyst team conducts exhaustive research in the effervescent products market by formulating a questionnaire to extract all the relevant data from all important stakeholders in the effervescent products market. The data is validated with the help of proprietary, company tools to ensure that you can make strategic, long-term business decisions by relying on our reports. In 2017, the International Food Information Council Foundation conducted a survey in which 40% consumers said they looked forward to weight loss, 11% wanted products for cardiovascular health, 11% sought out digestives and 34% were looking for products that benefited their muscle health, immune functioning, and oral health. The adoption of a healthier lifestyle coupled with rising disposable incomes across the globe should increase the consumption of dietary supplements and probiotics. To make the most of this trend, companies actively involved in the effervescent products market are launching innovative products that tackle nutritional deficiencies, enhance general wellbeing, and prevent diseases. Pharmaceutical products can be administered in different forms of delivery such as nasal, oral, topical, or injectable. A study found that swallowing tablets was often difficult, especially for the very young or very old. To overcome this critical health issue, pharmaceutical companies have turned to user-friendly alternatives such as chewable tablets, lozenges, orally disintegrating granules, and effervescent tablets. These formulations are more convenient, improve accessibility, extend the company product line and extend the product lifespan. Effervescent tablets consist of high amounts of active pharmaceuticals and can be easily consumed in a single dosage, as opposed to multiple doses. Companies are experimenting with novel drugs by including ingredients that tangibly impact their customer health and lifestyle. Companies actively involved in the effervescent products market often face problems while marketing the attributes of their products. A large section of the consumer base is unaware of the benefits of effervescent products and it can be difficult for consumers to justify paying the high premium that is often charged for these effervescent products. Companies need to emphasize that effervescent products only need a single dosage in comparison to compressed tablets that require a daily dosage of two or even three tablets to achieve a similar nutritional level. The pervasive lack of awareness amongst consumers has led to minimal adoption of the products available in the effervescent products market. Effervescent tablets, made largely of organic acids and a carbonated base, dominate the effervescent products market and are estimated to hold a market share just under 75% of the effervescent products market in 2017. 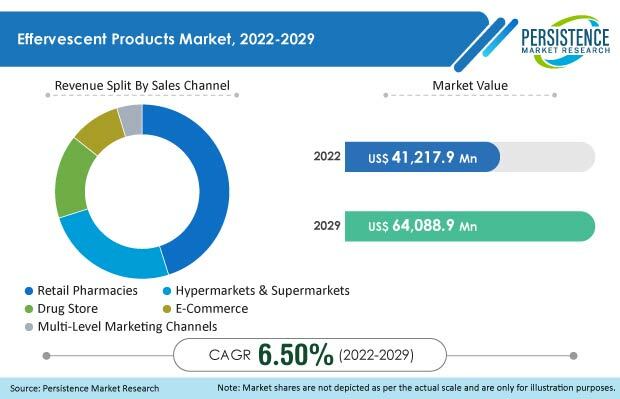 The effervescent tablets segment is anticipated to push past US$ 42 Bn by the end of the forecast period, making it imperative for key stakeholders in the effervescent products market to focus on. The effervescent tablets segment is larger than both effervescent powders and effervescent granules combined and it wouldn’t be surprising if companies in the effervescent products market decided to target it exclusively. However, the highest CAGR of 9.1% for the period 2017-2025 is predicted in the effervescent granules segment of the effervescent products market. North America is the largest regional contributor to the effervescent products market as the continent has a number of factors in its favor. Effervescent tablets account for a lion’s share of more than 70% of the North America effervescent products market by product form throughout the forecast period. Effervescent tablets represent a potential market opportunity of approx. US$ 15.7 Bn in North America by the end of the study period making it well worth the while of major players in the effervescent products market.